East Coast location of the San Francisco seafood-based restaurant. : San Francisco’s proud seafood destination has its second U.S. location in DC, and it has received a warm reception, so reservations are recommended. Décor is old-fashioned: white tablecloths and white-coated servers, along with wood accents and cozy wood-enclosed booths for a private meal. The menu presents a fresh selection of seafood transformed into familiar (New England clam chowder) and less recognizable (cioppino) dishes. Many options merit a sampling or two, but to keep consumption in check, pick one appetizer, such as the jumbo lump crab cocktail. Then scroll through the lengthy offerings for the ideal entrée. How about sand dabs, the delicate white fish native to California waters? Or perhaps the aforementioned cioppino, the seafood stew ostensibly created by San Francisco’s Portuguese or Italian fishermen? 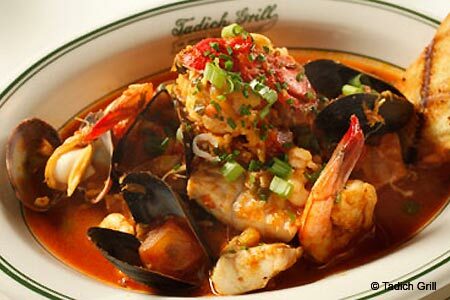 Maybe the Gulf oysters and bay shrimp Creole? The kitchen turns out some meat entrées, but seafood is the restaurant’s trump card, and you should stick with it. The dessert lineup is short and sweet, and if it’s available, go for the caramel bread pudding with a bourbon caramel sauce. The extensive wine list includes a “captain’s” section for high-end labels. Cocktails are appealing; check with the waiter for the day’s special.